Son of Man has been debuting at the Sundance Film Festival this week. I've been trawling the internet for a few days hoping to find some reviews for the film, and finally a few are up. All this purposeful restraint underlines tale's resonance for modern audiences, particularly wherever poor and ethnic minorities fight for equality. As a spur for discussion in both church and educational settings, "Son of Man" could hardly be bettered. Lenser Giulio Biccari's crisp, clean images typify the fat-free clarity of all design and tech contribs here. In song and originality, the spirit of Son of Man is contagious, a life-enriching elixir for Christians and non-Christians alike who feel mired in the unyielding bigotry of fundamentalism. By modernizing one of the world's most famous stories, Son of Man creates lasting resonance and imparts a significance that is truly glorious. I saw the film today at Sundance. It was a beautiful piece of work, very moving, and in many ways a believable rendition of Jesus' life and ministry into another culture, time, and place. I had the opportunity to ask Mark Dornford-Mays, the director, the one question that puzzled me: Why did we not hear in Jesus' preaching or teaching any reference to God, prayer, or religious observance? Did he mean to imply that Jesus was not the Son of God as well as the Son of Man? 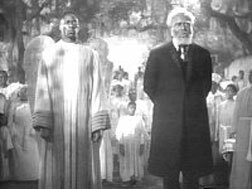 Mr. Dornford-Mays answered that Jesus referred to himself as the Son of Man, and pointed out that Jesus is pictured praying twice, and that other elements of the film (such as the frequent inclusion of angels) point to his divinity. I would love to see the film again and may do so if I can snag a ticket on Friday morning, the last showing. Mr. Dornford-Mays said the stage version of "Son of Man" will be touring the U.S. next January-February. He did not say anything about the release of the film but I will be looking for that information. Hope that whets your appetites a bit. "Nativity" centers on the two-year period of Mary and Joseph's life, culminating in their leaving Nazareth and journeying 100 miles to Bethlehem for the birth of Jesus. Key characters and events such as King Herod, John the Baptist's parents (Zachariah and Elizabeth), the shepherds who were witness to Jesus' birth; and the arrival of the three kings from the Orient will be fleshed out. More: Spec. Pre-emptive purchase. No producers are attached as yet. Looks like it could be interesting, although I've become a little suspicious of new bible films being made ever since the success of the Passion. On the one hand it's good to see more being made, but on the other I can't help wondering if this is studios trying to cash in on the Passion bandwagon. I've actually never seen a feature length film on the nativity story, unless you count Jean-Luc Godard's modern re-contextualising Je vous salue, Marie (Hail Mary). I have seen two shorter films that solely focus on the nativity, a 5 minute short produced by the Church of the Latter Day Saints, and a 45 minute film made by the same company that did Dogtanian, both of which were simply called "The Nativity". The latter is one of a myriad of cartoon versions of the story, most of which focus on minor characters. The former was sans dialogue, but did contain some effective sound effects like flies buzzing as Mary and Joseph enter the stable. But other fuller length films have been made of the story. Most notably two films at the end of the seventies went head to head. Madeline Stowe starred opposite John Shea in the , yet again, imaginatively titled The Nativity in 1978. This film also starred a pre-Indiana Jones/Lord of the Rings John Rhys Davies, and possibly the oldest character ever to play Salome, Kate O'Mara - a native of my adopted county of Leicestershire - who was pushing 40 at the time. I haven't seen any of these last four, and to be honest I find to difficult to work up any enthusiam about them. Most of the longer Jesus epics manage to wring as much screen time out of those few chapters as possible, and few of the nativity films have much in the way of innovation. That is probably why I appreciate what Godard was trying to do, although it's still a strange and over-long film. The most affecting portrayal of the birth of Jesus I have seen was actually from a BBC documentary Mary, which dared to show Mary as a young girl (as she apparently would have been), and a more realistic depiction of the birth - strikingly different from both the tranquil stable of the Christmas cards and the TV depictions of modern day births. Sadly though it appears that the new film will go down the traditional route. The mention of three kings (opposed to Matthew's unspecified number of "Magi") in the blurb above, and the mention of a journey from Nazareth to Bethlehem (as in Luke) opposed to the whole story seemingly taking place in Bethlehem (as in Matthew). This reinforces my worry that this film is seeking to cash in on the devout. Nothing in the blurb above suggests that the script takes a more historical, or challenging approach to the story - just what is needed in my opinion. I've been part of the Faith and Film Critics Circle for just over a year now, and recently we decided to get our own domain, and our own dedicated website. That was great news because it's a fantastic group - one I really feel privileged to be a part of (and wonder why they put up with me!) - but that isn't well enough known. Too often the media has been happy to take soundbites from film "reviewers" who only want to tell you how evil most films (except The Passion) are, and list the various body parts on display and how many swear words there are. Someone really should set a movieguide review to the tune of the 12 Days of Christmas. Within the Christian world, too often films are simply used as clips to illustrate the talk, rather than allowed to speak for themselves. So we try and do something different, allowing films be films, and see what they have to say, explore the issues they raise and look to dialogue with them and the wider culture. Sometimes, like the stories in the bible, they're not nice smiley stories with a happy ending. But often that type of film has far more to say than one that is. Anyway, I hope you like the new site, and check out some of the other critics who are part of it, most of whom write far more "normal film" reviews than me, and many of whom are good enough to get paid for it! Just a few comments on the last two episodes of The Living Christ Series. I'll be using my normal citation guide, though please note that most of episode 11 and the crucifixion is found in all four gospels. It is interesting that despite the extensive screen time of this series, the story of Peter's denial is missed out in episode 11 and included only as Peter explains his actions later on. Peter in general in the series is fairly anonymous. Whilst he does declare that Jesus is the Messiah, most of the mistakes that are recounted so particularly in Mark are omitted in this series. However, when it comes to Peter going to the tomb - he goes alone (contrary to John's gospel - the only one that places Peter at the tomb in the first place), specifically instructing others not to come with him. An interesting divergence from the text. This film excludes the controversial line from Matt 27:25 "his blood be on us and our children", and includes Caiaphas' prophetic statement from John 11:50 "better that one man die for all the people than the nation should perish". These particular lines have been very significant in the debate about anti-Semitism. The verse from Matthew has long been associated with anti-Semitism, whereas the latter verse from John has been key in unpicking what some of the motives were that caused the Jewish Leaders to hand Jesus over to the hated Romans. Interestingly enough, this film was made before the Second Vatican council which passed various statements on anti-Semitism, and these particular lines in general. Whilst I still haven't posted my thoughts on the first three episodes of this series, I would like to comment on the series as a whole now, rather than later. 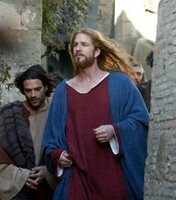 One of the most important factors in the assessment of a Jesus film is obviously how Jesus himself is portrayed. From today's point of view Robert Wilson's performance does seem very stiff and stodgy. It's worth putting a context around this film however. 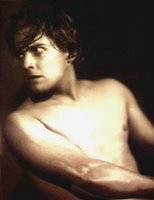 The last American Jesus film before this was produced around 25 years before - The King of Kings (1927). The next would be almost 10 years later - Nicholas Ray's King of Kings, followed swiftly by George Stevens' The Greatest Story Ever Told. It's also worth pointing out that prior to these later 2 films Hollywood had avoided showing Jesus directly for 34 years. In this context, then, The Living Christ Series and it's film spin offs I Beheld His Glory, and Day of Triumph exhibit a far more nuanced performance than was common at the time. The scene where Jesus sheds a tear when he arrives at the temple (included in both the series and Day of Triumph) was ahead of it's time, and whilst Robert Wilson's voice often lacks enough emotion, it stands up well compared to that of Jeffery Hunter in King of Kings. Hunter had to go through the whole film and dub on a more sincere voice. The selection of narratives is also strong in this series, including episodes that many Jesus films expunged because they inferred too much with their overall portrait. In fact this film, more than any other that springs to mind seems to be content to show each scene as it may have occurred without trying to tie it into a coherent overall picture, or force it into a particular agenda. The overall shape of the narrative isn't really damaged by this, and as such it's a refreshingly neutral approach to the subject. No film is entirely neutral, and this one shows it's biases just like any other (see above for an example). Some of the worst offenders are those films which claim to be without interpretation such as the Visual Bible's Version of Matthew which forces it's agenda of a happy American apple pie Jesus onto every scene, forcing him to laugh smile and goof around when it really doesn't fit. The biggest downside is that this film often lacks a bit of creativity, and rarely offers a new way of looking at things which may challenge existing prejudices - although the first episode is a notable exception. That said watched together the episodes don't work so well. That's not a major criticism - it was never the function of the film, but today's audiences might want to bear that in mind and watch one or two episodes together rather than expect to get through it all in a couple of sittings. It's also interesting how much more closely the episodes stick to the original narratives than the later films. Both of the later films use more sophisticated narrative devices like flashbacks, and in-character narrators to give the basic story a more film plot based screenplay. I'll post my thoughts on the opening three episodes shortly. A while back, in my Introduction to the Living Christ Series post, I mentioned four short clips taken from a Jesus film, but with an amusing voiceover dubbed in. Sadly at the time I couldn't find the link, but my friend Mike Leary posted me the new link over the weekend. Enjoy. It's interesting how late this version of the story leaves the death of John. In Mark's Gospel it is in the 6th chapter of 16 - only about a third of the way through. Here it appears in th 9th chapter of 12 - about two thirds of the way through. Admittedly the writers have jumped around the synoptic timescale a little, but even by this late stage most of the story is from fairly early on. Episodes 9 & 10 are the most "action packed" of the 12, with numerous individual incidents popping up. I like the way this communicates a sense of action, urgency, acheivement and popularity on the part of Jesus, it gives a sense that things are hotting up. It becomes clear as we are now this far through that the plot framework is mainly derived from Mark (and by defintion the two other synoptics), rather than on John. I noted when looking at episode 7 that that particular episode was largely incidents reported only in John. Seen in context we can see that this continues well into Episode 8, but also that these stories really just form a parenthesis from the main story. Once the brief diversion into John is over we are back into Mark's story line, and there is only one more incident from John's gospel before the passion narratives - the obligatory raising of Lazarus. I think this is the only film to show both the sending of the 12 and of the 72. I should perhaps qualify this by saying that it was a while since I watched these two episodes, and it's not clear from my writing whether I have (as I assume) written "sending of the 12" twice or whether the second one is "sending of the 72). Excellent professionalism there. The Transfiguration is quite a rare episode in Jesus films. Aside from those films which are based on a complete gospel (e.g. Visual Bible's Matthew) this only appears in The Life and Passion of Jesus Christ and Jesus (1979) - the latter of which is cut from a film of the whole gospel of Luke anyway. I have a nagging doubt that there's one more, but unless it's The Revolutionary, then I'm stumped. Finally it's interesting that the major share of the story of the Rich Young Man is missing. This for me is one of the most challenging passages in scripture, and so I always smell a rat when it's tampered with. I wonder who's decision this was to expunge the part where Jesus tells him to go and sell all he has to the poor? I thought it would be useful to explain how and why I cite biblical references. It's a little complicated as, unless you're watching one of the films that are based solely on one gospel, filmmakers pick and choose from the differing accounts. Sometimes they harmonise the different gospels' unique perspective on a story, sometimes they clearly choose one over the others. In addition to this I don't have the time when watching these films to flip through a bible comparing gospels, whilst taking in the film at the same time - particularly if it's my first viewing. I may - in time - re-visit some of these films with a scene guide in front of me complete with references for the different version or something, but that's certainly not for now. Offer me a book deal, however, and I'll be only too willing to oblige! So anyway, where I cite bible references they are only a guide. Where an episode exists in two or all of the synoptic gospels I'll tend to cite it from Mark even if the filmed version corresponds a little more closely with Matthew or Luke. I'm confident enough that Mark is the earliest gospel to feel that this is an acceptable convention. However, if I know that an episode is based on a specific gospel then I'll cite that. If the story is in both Luke and Matthew, but not in Mark, then, I'll usually cite it from Matthew - again unless I know better. For what it's worth there are two reasons for this, firstly, because being named after that gospel has always given me an affinity for it, but primarily it's because I'm enough of a Q sceptic to think Luke may have used Matthew as a source. (Normally stories common to Matthew and Luke, which aren't in Mark are said to derive from Q - a hypothetical common source many scholars like to posit actually existed, but is now lost. For more on this see Mark Goodacre's "Case Against Q" site). Stories from John are a bit easier as they tend to be unique to his gospel. However, on the rare occasions John shares stories with the "synoptic" gospels (Matthew , Mark and Luke), again, I'll tend to cite Mark unless it's obviously based on one of the others. Episodes not found in the Bible, or another recognised ancient text, are designated as extra-biblical episodes (EBE). More recently I've described these as well as noting their existence. OK - it's a bit messy, and my apologies for that, but I'm on a tight time scale here, and even withh all the time in the world it's not 100% obvious with some episodes. By the way, thanks to Bible Gateway and Five Gospel Parallels for making this task a lot easier. A superior version of these guides is available for 18 of the major Jesus films in Staley and Walsh's "Jesus, the Gospels, and Cinematic Imagination"
I've re-formatted my links, and added several new ones, including a list of all my bible film reviews, and links to lists of all the film reviews I've written over the last two years. If any of them turn up wrong, please let me know! FWIW I've also re-jigged my "About Me" section. 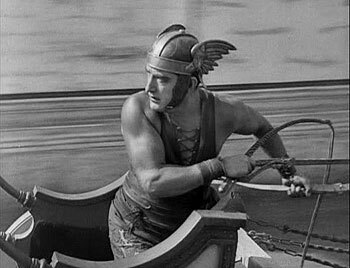 One of the things I'd like to do with this blog is keep readers posted on up-and-coming biblical films as well as discussing bible films from the past. In some ways Abel Ferrara's Mary is in a third category - bible films present. On the one hand it has already premiered at various film festivals (Deauville, Toronto, Oslo, Sans Sebastián and Venice, where it won the Gran Prix jury prize). On the other, it has not got to general release yet except for Italy and France (and Belgium according to the IMDB). I can't find a date for a UK release, and it doesn't look like it will reach the US until June. From what I've read the film is along similar lines to Jesus of Montreal (1989) and Man Dancin' (2003), although it is about the making of a Jesus film rather than a Passion Play as in those films. This would make it similar to Pasolini's La Ricotta (his contribution to four-films-in-one film - Ro.Go.Pa.G. ), which I've never seen, but Peter Chattaway discussed at his FilmChat blog a while back. The cast is an unusual mix combining queen of european cinema Juliette Binoche with Heather Graham (of Boogie Nights and Austin Powers 2 fame) Matthew Modine and the much underated Forrest Whittaker. Modine (right) plays Jesus in the film, looking like he's just stepped off one of Holman Hunt's paintings. 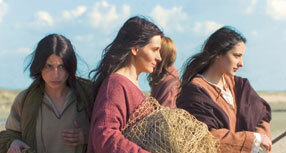 For what it's worth this shot is very reminiscient of the first view of Jesus we get in Roger Young's 1999 Jesus film. There are more shots from the film up at the official italian website, and some of them look incredible. Also, a number of clips from the film and the trailer are now online at Twitch. Despite general release being a way off, there are plenty of reviews up already. I personally don't want to find out too much about the film before I see it, so I've read the Variety Review and little else. If you don't want to wade through a large number of reviews then it doesn't seem to give away anything that wuill spoil the film, pluis it's a respectable enough publication to be fairly reliable. There are more comprehensive lists of reviews posted at both Rotten Tomatoes and the IMDB as well as a number of user comments at the latter. So although I'm not sure when I'll get to see this (perhaps even not until the DVD release), I'm very much looking forward to it. I recently got hold of Ferrera's most famous film Bad Lieutenant, another film I haven't seen, but I'm led to believe it also touched on religious issues. I may post some thoughts on that once I have seen it. Jeffrey Overstreet has posed an interesting "What if" question of the day...over at his Looking Closer Journal - If someone were to pick up where Mel Gibson left off and direct the next ambitious New Testament film... who should direct it?. So far Paul's story in Acts is the front runner, and I suppose that is not a big surprise. 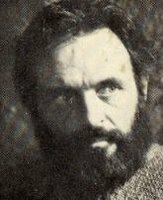 There have been a few attempts at the story of Paul, most notably Peter and Paul starring Anthony Hopkins as the man from Tarsus (and featuring in the Arts and Faith Top 100. There's also been Paul The Apostle made for the Bible collection, Paul the Epistle (made by the same people who made the Jesus film The Revolutionary), Anno Domini, and the Visual Bible's Acts not to mention "cameos" in 50s biblical epics such as Quo Vadis?. He also appears, albeit briefly in The Last Temptation of Christ. Of these Hopkins' portrayal is, as you would expect, the best by some distance. One other dramatic portrayal that I appreciate is the fleeting glimpses of him in some dramatised scenes from the BBC documentary St. Paul, although I hasten to add not the ones where he rolls around trying to illustrate the unlikely scientific theory that had just been proposed for Paul's Damascus Road Experience. (There is some discussion of these various films about Paul at Arts and Faith. The difficulty with Jeffrey's question is that if it's not Paul, then there isn't so much else to go on. Sure, Mel Gibson made a two hour film out of the few chapters we have in the bible that cover Jesus' trial and death. But once you take Paul out, then nothing in the remainder of the NT has as much significance, or sufficient back story. Probably the best remaining option is the story of Peter, but even with his key role in the Roman Catholic Church it's debatable whether there is sufficient tradition to flesh out his story as there is with Jesus's Passion. The other option would be the life of John. This too has been attempted recently, again by the Bible Collection, in their series finale The Apocalypse (my review, hosted, as it happens, at Jeffrey's main site). There are certainly flaws with this production, but you can see what it is trying to do, and as such it is fairly admirable. Given that both John and Paul have been covered recently, I would have to plump for a story around Peter. As for a director, my choice would be a bit more straight forward. To really get the most out of the available story/tradition they would need to have some routing in Catholicism. In order to make a film that is interesting in itself, (rather than because of the controversy surrounding it, like The Passion) they would perhaps be better being slightly detached from the faith they were brought up in. There are a few candidates here, but perhaps the one with the best pedigree, and who would be most interesting would be...Martin Scorsese. 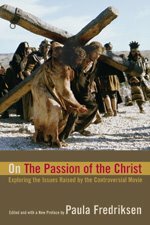 Mark Goodacre's New Testament Gateway Blog notes that Paula Fredriksen has re-issued the book she edited on Mel Gibson's Jesus film Perspectives on the Passion of the Christ. The re-issue has a shorterr title as well, simply On the Passion of the Christ. I note that Goodacre in his brief commments on the original book, as well as the reviewer he cites both found that book lacked, um, perspectives, so I can't help chuckling at the title change. It's one book on The Passion of the Christ that I've not read yet, although, in my defence, there are a lot of them. Goodacre's lists this one and two of the more scholarly ones that I have read. Eric Thurman has added 3 more, (none of which I have read), but you only have to look at this Amazon page to see just how many there are. I'm sure only a fraction of the 1142 listed relate to the film, but, off the top of my head, I can't think of another film that has been written about to anything like this extent. This is something I've been mulling over for a while, and I've decided the New Year is as good as time as any, particularly as my 2 month kitchen building project is finally over. I plan to post some decent content before really going public, so if you've just stumbled across this then please accept my apologies, and come back soon.